The Sound: Acoustic Guitar and Vocals. The Source: Traditional, Contemporary and Originals. The Style: Folk, Blues, Country, Pop, and Bluegrass Gumbo! Acoustic guitars and American troubadour music have been Mike’s passions since childhood. He now creates unique guitar and vocal arrangements covering a wide variety of musical styles. 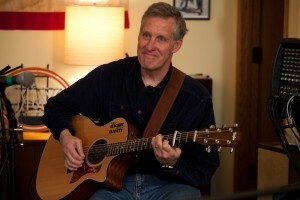 For the last 15 years he has been performing in the Madison area as a founding member of MUD Music. Now he returns to his roots – one guitar, one voice and a pocketful of recently-penned originals plus some old favorites from Woody to Neil; from Dylan to the Dead. All rolled into a nice slice of Americana pie!